The Gripit Floss Holder is a huge time saver! The Gripit Floss Holder holds floss very tightly so users don't have to pinch their fingers or put fingers in their mouth when flossing. 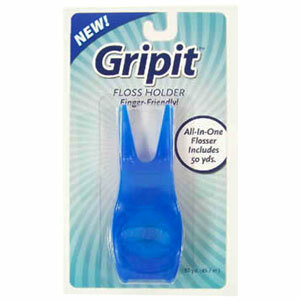 Gripit Floss Holders are the only flossing tool to pop open and allow a fresh length of floss to be advanced in seconds. Gripits are also ergonomically designed to help people with arthritic conditions floss more easily. Gripit Floss Holders make flossing an effortless routine. Refill with your favorite waxed, unwaxed, or flavored floss and most dental tapes. Easy to clean it is dishwasher safe.